The Dwarf Loach has probably always been my favourite loach; with Clowns and Emperors coming a very close second. For me, there is just something about the outgoing character of Yasuhikotakia sidthimunki that sets them apart from other loaches. I have kept Y. sidthimunki on and off continually throughout my 30 years of fish keeping, but had only ever kept them singly or in very small groups of 6 or so fish. A few years ago, after buying 4 Sun loaches (Y. eos), I stumbled across the website and forum ‘Loaches Online’. To cut a long story short, I have been a fully fledged ‘loachaholic’ ever since! 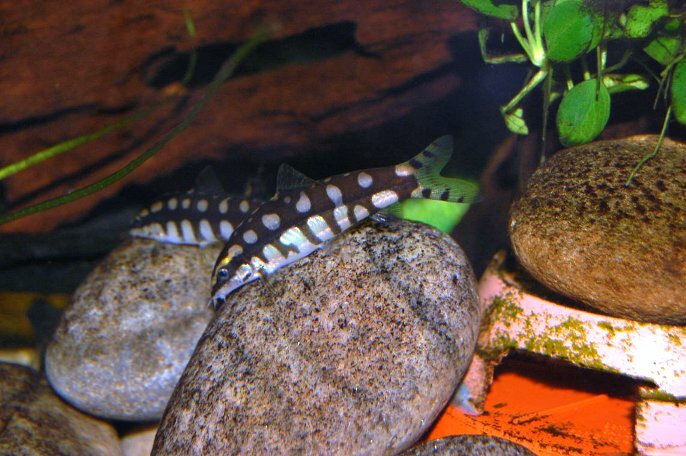 I started building my collection of loaches in 2005, but felt that there was always something missing. I was visiting a couple of local tropical fish shops during April of 2006, when I noticed that one particular store had just received a shipment of “Chipmunk loaches”. These turned out to be Y. sidthimunki and were on sale at only £3.50 each. This was a fantastic bargain, as they were less than half the price that other local shops were selling them at, so I made an immediate decision to get 10 as the price was so good! All 36 Y. sidthimunki were around 1” TL and were initially housed in a 114 litre quarantine tank. After 3 weeks, I started a 5 course treatment of ‘Levamisole’ de-wormer, because a few of the loaches looked a little on the ‘skinny’ side. After the 5 treatments had been completed, there was a dramatic improvement; all the fish had gained a reasonable amount of weight. In the spring of 2007, all 36 Y. sidthimunkiwere moved into their permanent home – a 284 litre aquarium – along with shoals ofRasbora heteromorpha, Rasbora espei, Danio choprai, Puntius gelius and Puntius pentazona. A week or so later, I also added a small group of Kuhli loaches (Pangio sp.) and 2 weeks after that, 8 Mesonoemacheilus guentheri. The tank was well planted with Java fern, Java moss, Indian fern, Vallisneria, andAnubias barteri var. nana, with Lemna gibba floating on the surface. The aquarium is furnished with a mix of slate caves, cobble piles, upturned plant pots of various sizes and 4 pieces of bogwood. Substrate consists of 70% fine and 30% medium grade gravel. The pH is normally around 7.2, with nitrites and ammonia both at 0, and nitrates sitting between 5 and 10 ppm. I live in an area with quite hard tap water, which I initially thought might be detrimental to my chances of spawning any loach species. A head count has since been carried out, and there are now 42 Y. sidthimunki in the tank – an increase of 6 from the original total. Given the number of adult Y. sidthimunki in the tank and given the other inhabitants, it is amazing to think that these juveniles have survived. Going by the size and age of these young, I would estimate that my adults are between 18 months and 2 years of age. One thing I am a little bemused about is that at no point over the last couple of months have any other fish in the tank looked like they have feasted on large quantities of eggs or young fish, so I am unsure as to whether a low quantity of eggs were laid, or if they were very tiny eggs and this hasn’t shown. I am planning on adding more Indian almond leaves to the tank again soon, and will carry out some cooler water changes at the same time. With any luck, these actions will be the key to triggering a repeat of the spawning activity. I am eager to capture such an event on video, should it happen again, and am hopeful that this time I will be able to see some eggs, or at least gain more in-depth information as to how these wonderful loaches spawn. It would be great to actually see the eggs being laid, and possibly even rescue some of them. Egg and fry development photographs would be amazing to obtain too! The basic layout of the tank will not change at all, because I think the amount of bogwood, plants and piles of cobbles are enough to ensure that some fry will survive – at least until they feel brave enough to venture out into the open and run the gauntlet of the adults and other tank mates! I have been asked if I would be tempted to remove the other fish from the tank, but to be honest, I would be very reluctant to take out the Rasbora species because in my opinion, these make the best ‘dither fish’ to live alongside Y. sidthimunki. 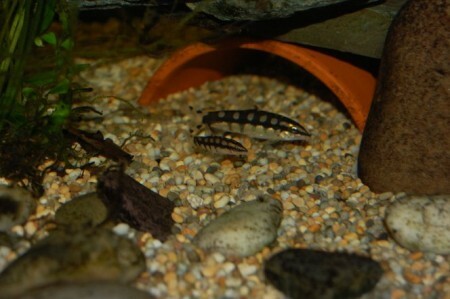 Before the Rasbora were added, the loaches were very shy and hid 90% of the time. 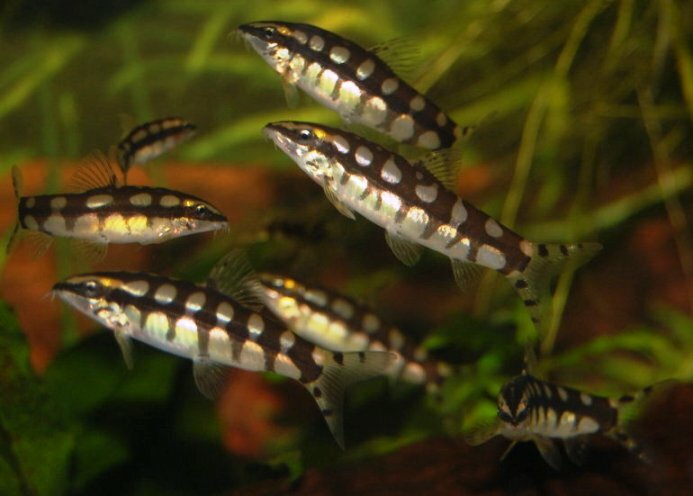 However, since the addition of the Rasbora, the Y. sidthimunki are out and about 90% of the time. Indeed, it could well be that the loaches felt so relaxed and secure in their surroundings, that were happy enough to spawn. I also appreciate very much that you share your experience. I used to have a small group of Yasuhikotakia Sidthimunki for a number of years in a 325 litre tank. And while other fisk came and went, I mostly enjoyed the YS. Now I plan to start up a new aquarium. Actually only with a group of YS. But if I understand you right, they prefer company from Rasbora. Now what kind of Rasbora are you meaning?